In 1763 the Royal Botanic Garden Edinburgh (RBGE) moved to a new home on Leith Walk. It would stay there for six years, a vibrant centre of learning during the height of the Scottish Enlightenment. At its entrance stood a small but handsome building, which would later become known as the Botanic Cottage. This little house was the home of the Head Gardener, an entrance way to the garden, and on the upper floor, a teaching space for Regius Keeper John Hope. When RBGE moved to Inverleith in the early 1820s to escape the rapid building work which was surrounding the Leith Walk site, and to expand its collections in a larger space, the cottage was left behind. Over the centuries it became a private home, offices, and finally in the early 2000s it was abandoned. In 2008 the cottage was saved from destruction and dismantled stone by stone, in anticipation of being rebuilt in the present RBGE site as a centre for community and education use. The site on which the cottage stood, and the surrounding area which once formed part of the Leith Walk Botanic Garden, will soon become a building site as student flats and other facilities are to be erected there over the coming year. However, we have received permission from the new owners of the site for us to do an archaeological dig of the old Botanic Cottage site this July. It will be our final chance to uncover clues about one of the oldest botanical buildings in the country, and possibly help tell us a little more about the long lost Leith Walk Botanic Garden too. The area marked in red (below) is the site of the cottage, and where our dig will take place. 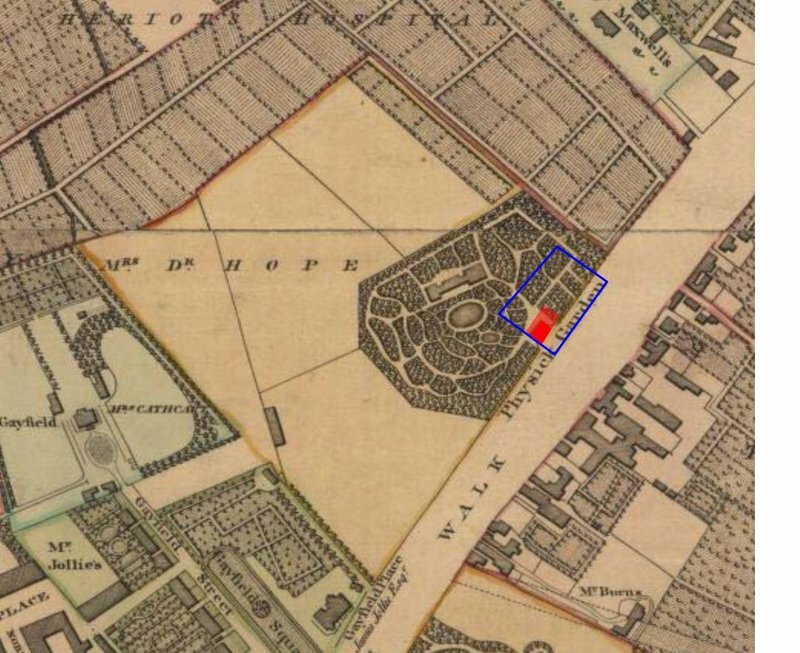 The Botanic Cottage site is just up from the McDonald Road Library at Haddington Place (the place to meet is marked with a yellow circle on the photograph). We are ideally asking people to commit to a whole day, lasting from 10 am until 4pm. As safety instructions, initial training, etc. will need to take place at the start of each day, time will go by quickly, and we therefore want to maximise the amount of archaeological work which can take place, and half day sessions mean that safety, training, etc. need to be repeated. If you are able to do more than one day, we would be delighted – this greatly helps the professional archaeologists as it means that you will ‘know the ropes’ and can get stuck into activities. We might be able to accommodate people doing some half day sessions if they have already done a full day before. You do not have to have any experience to take part, but if you do, please let us know as it will be useful for the archaeologists to be aware. There will be two professional archaeologists from the firm Addyman Archaeology who will lead the dig each day, and they will provide basic training in different activities which you might undertake – scraping earth, cleaning finds, making recordings, and so on. They will also give safety instructions which must be followed. The site has uneven ground and has been abandoned for several years – there may be sharp objects, things protruding from the ground, stinging plants, and such like – please take great care. Wear old clothes which you do not mind getting dirty, and sturdy boots/shoes. You do not need to bring any equipment with you. Please let us know if you have any health conditions which you think could be affected by being involved with the archaeological dig, and if you have any special access requirements. If there are some jobs which you do not feel that you are able to do (digging, scraping soil on the ground, cleaning, etc.) please let us know and we will try to ensure that there are other activities which you can be involved with at the dig. As this is an archaeological dig on a site which has no existing facilities, a unisex portable toilet will be set up on site but there are no standard public toilets on site. We will provide tea, water and light snacks, but please bring lunch with you, or alternatively, you might want to nip to one of the cafes on a street nearby. More information will be sent out ahead of the dig itself. Thank you so much for volunteering – we’re delighted that you can be involved!